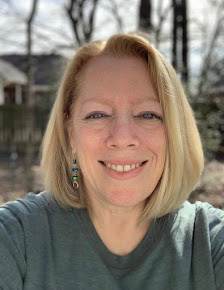 My Journey to Fit: Thirty Years! And, Where Are the Forks? 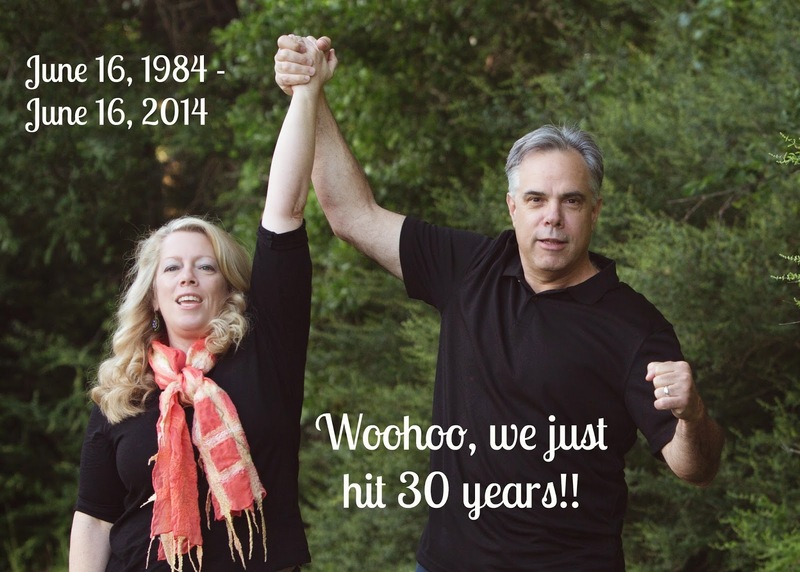 Thirty Years! And, Where Are the Forks? 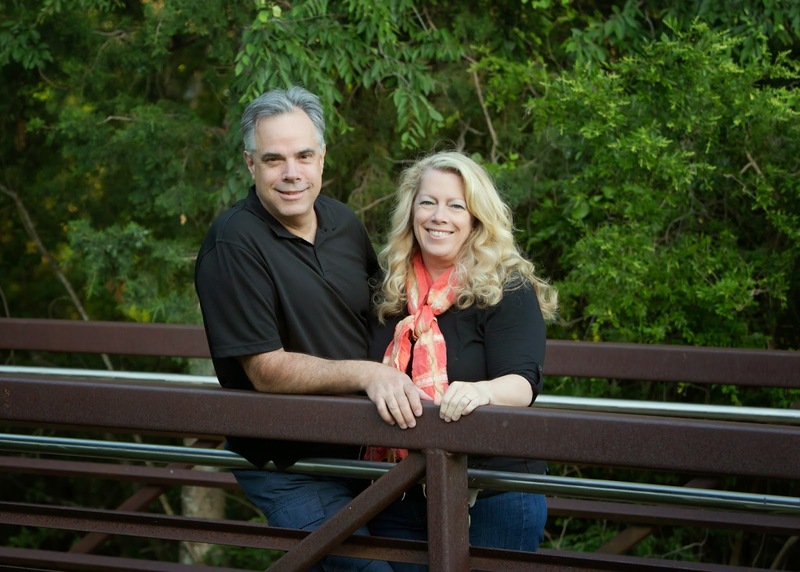 Today is our 30th wedding anniversary. Just writing that makes me think we should look old and gray-haired, sitting in rockers, watching the world go by. NOPE! 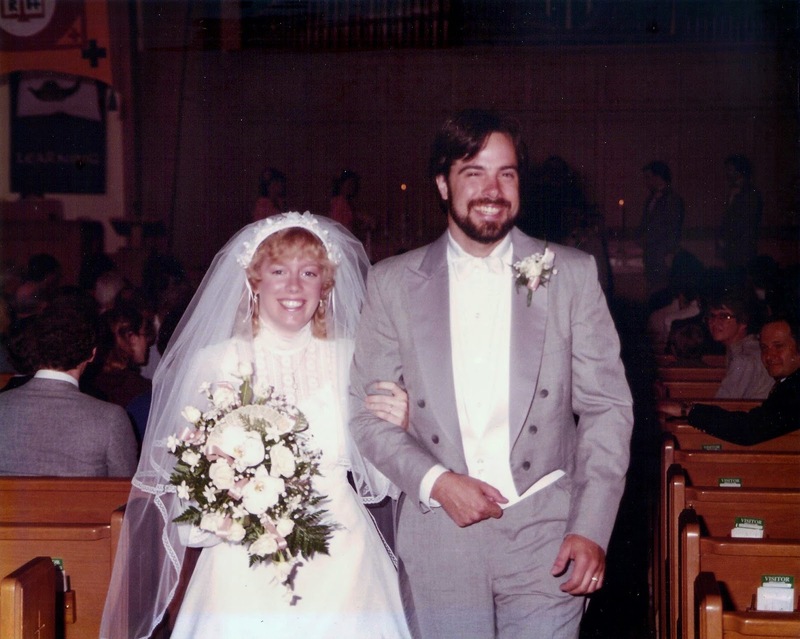 While being married this long (or doing anything long enough to celebrate 30 years) sounded like forever back when I was a kid, truth is, we both still feel like ourselves and not the industry standard of old married folk. June 16, 1984 - the faces of relief! A bit more relaxed. I wore an orangish scarf that my mom made as an homage to our very 80s peach wedding color. 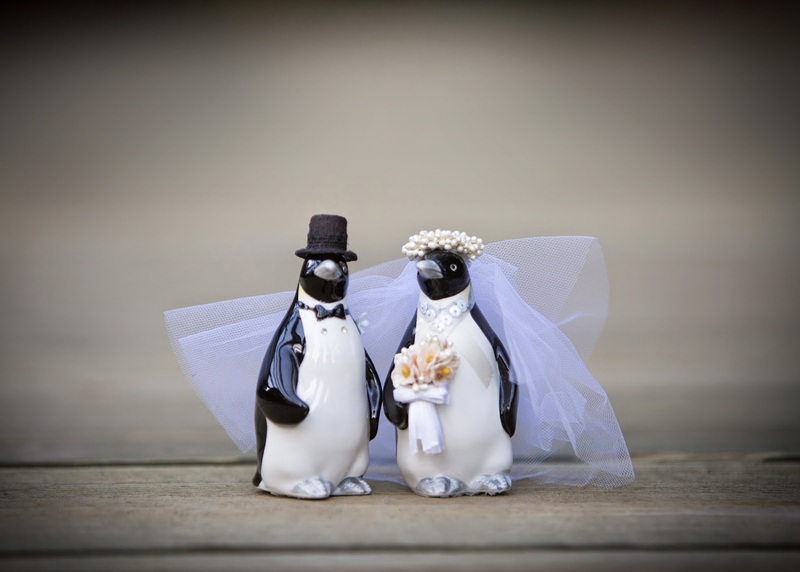 Jeff's grandma turned the penguin salt and pepper shakers into a bride and groom for us - I think they are still so cute! When we got engaged, I remember several grandparents telling me that marriage wasn't both of you putting in 50% - it was more like 85%. Which doesn't make mathematical sense, but if you've ever lived with someone for a while, you know it's the truth - you need to put in more than your share of effort if it's going to work. So far we've both put in our 85% often enough to make a go of this crazy thing called marriage...it's not always sunshine and rainbows, but I can't imagine doing this with anyone else. Annnd, that's about as mushy as I'm going to get here - neither of us go in for social media declarations of love (compatibility index: high). Now, about those forks...when we got married, we registered for all the standard stuff - everyday dishes, china, stainless steel flatware, towels, etc - and were lucky enough to receive a bounty of gifts that, to this day, I can pretty much tell you who each item came from. We received 12 place settings of our flatware. About a year ago, when I had dividers put in my silverware drawer, I counted everything as I put them in the drawer. I only have eight forks now. Where are the rest of them? I guess over the course of 30 years, losing four forks isn't a lot, but dang it, I like our silverware, and this pattern isn't available anymore (except occasionally on replacements.com, where a single fork costs nearly as much as the entire five-piece place setting did back in 1984). Just another great mystery of marriage, I guess. Congratulations! You were, and are, a very good looking couple! Savor the day…each one of them. It's funny that in the year you are married for 30 years, I will be living with R. 20 years in October. Even here there's a simular thing between us. Again, congrats Jeff and Shelley, you are a great couple together. Congratulations! I can totally see you two making it for 30 more!! Congratulations! You both look really good 30 years later!! congrats.... no small feat being married that long... here's to 30 more !! Happy Anniversary!!!!! 30 years is a pretty awesome milestone these days. What struck me hanging out with you guys is that, after all these years, you seem to genuinely love spending time together. I don't have a lot of models for long AND happy marriages, so as a still somewhat newlywed (coming up on 2 years this fall), it's cool to see that. Congratulations on achieving this milestone, Shelley! I remember how the colour "peach" was all the rage in the 80's. I was married in the seventies [!] & it seemed pastels & floppy hats were the fad when we were married way back then. Cheers & all the best to you & your beloved! I remember those floppy hats! I think we'd just moved beyond the "baby's breath wreath" hair adornments for weddings by the time we got married - whew! You guys look awesome! It's funny but I had a teacher who used to play bridge with my Mom when I was in grade school - one night of bridge it was her birthday so my Mom made a cake and I asked how old this teacher was and she said 42 and I was like "wow, that's so old!" Ha! Now I am 46 and I think that's the new 26! Happy Happy Anniversary to you!! Happy Anniversary!! You look exactly the same (better hair now!) but Jeff looks so different. I guess its the facial hair? He looks good in a beard. Wishing you many more years of happiness! I just love this post! And, we lose spoons at my house. Sorry about the forks. Happy Anniversary!! I love the idea of having anniversary pictures made - especially love the 'victory' picture up there! So cute!! I love the penguins & their outfits. Hee hee. Nice keepsake. And gawrsh we both married young! And still were able to make it work all these years! Huzzah!! On the "collectible" front, I have a set of Corning Ware bowls (white/blue, with flowers) that were a bridal shower gift, and I've seen them in ANTIQUE SHOPS!!! Crazy. Congratulations to you two! And it really takes effort on both sides to make a marriage work. I would say it's more like 100% involvement rather than 85%, as well. Yeah, you sure can tell the height difference in that arm picture - he's done that when we've crossed the finish line at some races and nearly pulled my arm off! Congrats!!! Try ebay for the missing forks! I found some on ebay, but ack, the price! $25 each!!! 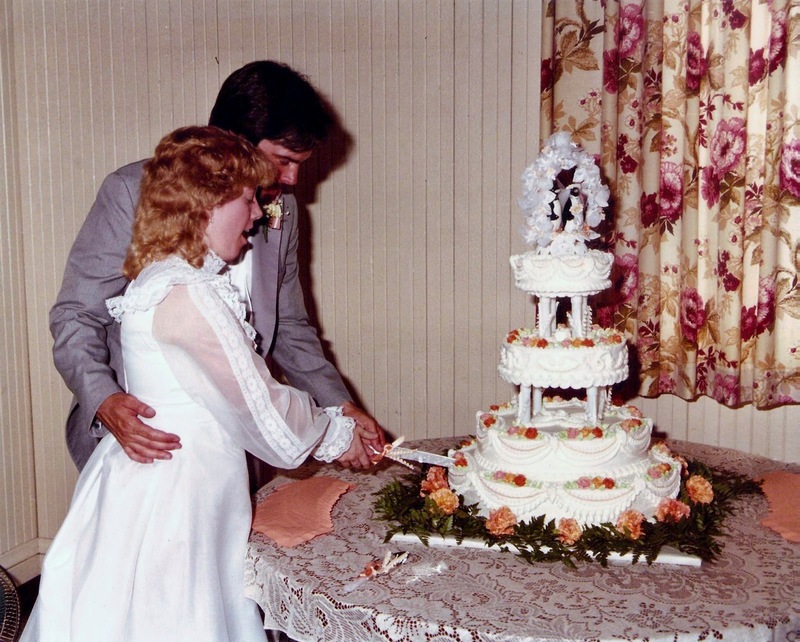 Congratulations to you and Jeff on 30 years - y'all looked great then and you look better now!!! Congratulations! Adding to the chorus of how darling the cake topper is/was! What a cute idea! I think only missing four forks is an amazing accomplishment -as well as the thirty years of wedded bliss. May the next thirty be even better! BIG BIG CONGRATS to Shelley and Jeff!!! 30 down, 30+ more to go! Best wishes to you both!!!!!!! Congratulations! It will be 32 years for us in September. My wedding dress was similar to yours, with the high neck, and my bridesmaids wore peach! I wore a hat, though, instead of a veil. My son got engaged a week ago, so now we have another wedding to look forward to! Congratulations! You guys are too funny -- love the shot of you with your arms raised together. Hahahaha -- you made it!